Kathmandu is the capital city of Nepal. It is the first place to be seen upon your arrival in Nepal. Kathmandu is the valley surrounded by the mountains and there are three cities in the valley named Kathmandu, Bhaktapur and Lalitpur. These three cities were the small kingdom once and they retain their rich artistic styles. 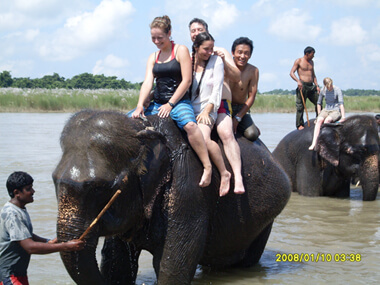 This encounter on foot with the environment will introduce the main features of eastern Chitwan. Sal forest, open grassland and reverie jungle. Our guides will help you identify some species of birds, plants and other wildlife that you may encounter. Around 8:30AM breakfast will be served. After breakfast, we process on Elephant-back safari or depends of hotel itinerary: Guests will ride on an elephant to explore the jungle and wildlife you will be able to see the one-horned rhinoceros, several types of deer, monkeys, wild boar, bison, sloth bear, leopard and, if lucky, the Royal Bengal tiger. This exciting ride lasts for 2 hours. Lunch will be served around 1.00 PM: After lunch, we have Canoeing Trip: A traditional dugout canoe takes you on a silent trip down the Rapti river to view aquatic birds and the animals of the riverbanks. Back to resort through the Jungle. In the evening, Tharu Stick dance show: Farmers of the nearby villages will show some of their traditional skills and dances. Your next destination, Nagarkot, is blessed with sheer beauty of nature and panoramic Himalayan views, giving you a once in a lifetime experience. On returning back to Kathmandu, your trip will further resume towards exploring more of Kathmandu. Visits to Kumari Temple and Durbar Square are the bonus sightseeing trips packaged in this tour. After visiting Pashupatinath, we drive to Bhaktapur - the City of Devotees . There is a one big museum in Bhaktapur which is famous for temples, palaces and houses dating back several centuries. Drive back to Kathmandu. Overnight stay at hotel. After breakfast, we drive to Chitwan and check in upon arrival. Lunch will be served at the resort/lodge. In the afternoon, we proceed for a tour to Tharu Village and witness the Tharu Cultural and Performance. Overnight stay at hotel. After breakfast, we take a quick tour of Bird watching. Then we drive to Kathamndu. Drive to Kathamndu. Over night stay Hotel Newache in Patan. After breakfast, our city guide reaches in Hotel with Vehicles, and Patan is located 7 km away from Kathmandu, this city has many 15th to 17th century, Hindu and Buddhist, monuments built during the Malla dynasty. Then we drive to Bhaktapur Durbar Square. Bhaktapur is one of the oldest cities in Kathmandu valley. It is well known as Living Museum. Old brick paved enclave of old Royal palace, Nyathapola Temple, Datatriya temple, exquisite artwork offers a picture of the grandeur of medieval Nepal. We are enjoying seeing sunset in Nagarkot. Over night stay at Hotel. Early wake up call is given by the hotel staff to enjoy the sunrise. 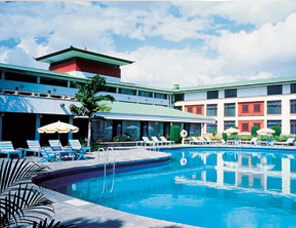 Have panoramic views of Himalayas from the hotel tower, after we drive to Kathmandu. Free day in Kathmandu, overnight stay in Hotel.